I have had the last 5 days off and have been in vacation bliss! I hope you all are getting some downtime as well! I traded photography for a trip to Ocracoke Island. I can’t say how grateful I am to have this opportunity. I have been cooking like a mad woman- all of the recipes I haven’t had time to try- while sipping generous amounts of wine:),walking the dog and riding bikes to balance out all of the calories, and today I took a nap!!!!!! I have to admit, that I haven’t touched my camera since I have been here- it is beautiful here- but it is so nice to just look at it, take it in and not obsess about capturing it on film. I am one of those people who tends to work at all times, but this week, it has been all about comfort and chilling out. Next week I will be back on track and thinking about the new year. I hope you all are spending some time taking care of yourselves. ok… have to get the vegetable torte out of the oven! New jewelry collaboration with Mood Swing! What a whirlwind few weeks it has been! Between holiday work, Chix in Business and a new collaboration, my head is spinning! I wanted to write a little about this new collaboration with my good friend, Kristen, aka Mood Swing. She makes the most incredible jewelry- and I am so excited to be working with her on these necklaces. I have a bzillion personal images that I have taken over the years. I love to photograph these little “Vignettes” – usually landscape or architecture-in my time off- capturing quiet moments- filtering out distractions both in my mind and through my lens. This time is a complete contrast to my everyday shooting of families and children, where things are loud, wild and playful, sometimes bordering on out of control:) I have tried different ways to produce these Vignettes, using Polaroid transfers as well as printing them small, straight from the negative. 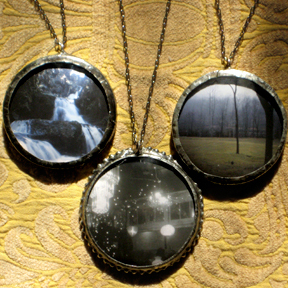 But these necklaces are so perfect at framing this work and displaying it in a way that fits the vision of how I see them. Looking into the concave lens(a vintage eyeglass lens) that mimics a camera lens, surrounded by soldered metal that has been oxidized then waxed- you see a tranquil perhaps almost haunting place. I have the images printed as giclees- using archival inks. They are wearable pieces of art- built to last and hopefully loved a long time too! They are hosting an open house on Monday December 14th from 4-8 pm! Stop by and check it out!